“Good architecture is also sustainable architecture, and that covers not only ecological and energy considerations, but also economic, social and aesthetic aspects”. This is the philosophy behind our Model D Homes range. While respecting tradition, we will not be shackled by it. Our top priorities are minimal energy consumption, low environmental impact, and to provide comfortable and inspiring houses that many people can enjoy living in. A ‘Model D’ home prototype was erected at Sylvan Stuart’s Pitmachie Works site in 2011/12. This is an innovative design seeking to replicate a traditional rural building form, with extensive southerly glazing and rain-screening to soften the landscape impact and provide shading. The prototype house also aimed at achieving exceptional cost-effectiveness while maintaining very high energy performance standards. It has received a number of design awards, including the RIAS/RIBA and Saltire Housing Design Awards in 2012. The construction specification of our homes is also designed for durability and minimal maintenance. While the structure is entirely timber, and clad with wood outside, almost no external painting is required over the long life of these homes, which are designed to complement the landscape. The contemporary design solution we offer is an antidote to mock vernacular houses that have to compromise performance standards in an attempt to look traditional. Our glazing is located to harvest the warmth of the sun, and solar thermal panels are integrated with the Velux rooflights. 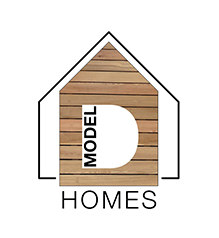 The Model D Homes range offers exceptional value and performance at a price which many can afford. Our homes aim at having minimal impact on the landscape and in their use of finite resources. We want to set the standard for environmentally friendly rural living.